PINE BLUFF, Ark. – Strawberry production trials by the University of Arkansas at Pine Bluff show that using high tunnels, low tunnels and plastic mulch can extend the growing season. Such systems allow early planting of strawberry plugs, increasing the yields and quality of strawberries, leading to increased profitability, said Leonard Githinji, an extension horticulture specialist at UAPB. The university is exploring methods to establish and expand sustainable strawberry production in the state, he said. The project is funded by a grant from the Walmart Foundation and administered by the University of Arkansas System Division of Agriculture Center for Agricultural and Rural Sustainability. 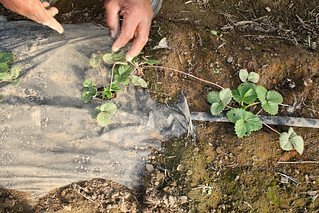 A sustainable strawberry production workshop, a field demonstration and hands-on training on strawberry production for farmers and Master Gardeners, were conducted. A strawberry production presentation was also done at the Horticulture/Environmental and Natural Resources Committee meeting. Sites in Jefferson, Lee and Lonoke counties are being used for demonstration of extension of the production season for strawberries; sustainable soil quality improvement; sustainable pest and diseases control and use of beneficial insects for strawberry production. Demonstrations also include reduction of chemical fertilizers and pesticides in strawberry production; water and energy conservation in strawberry production; reduction of human pathogens risks on fresh strawberries; and economic analysis of strawberry production. “We demonstrated the effectiveness of using anaerobic soil disinfestation and soil solarization to control soil nematodes and weeds, eliminating the dependency on methyl bromide, which is known to harm the environment and is potentially injurious to the users,” Githinji said. The project also demonstrated that strawberry producers can minimize use of chemical fertilizers by applying various biological soil fertility strategies, including crop residues and compost, he said. In addition, field demonstrations included water and energy conservation by means of drip irrigation systems and mulching. The anticipated long-term outcome will be increased strawberry production capacity, reduced input cost of strawberry production, and increased sales, leading to increases socio-economic and environmental sustainability, he said. A training workshop and field demonstration is scheduled for April 15 at UAPB’s 1890 Extension Complex. Workshop topics include: lessons learned from the strawberry project; integrated pest management and use of beneficial insects for strawberry production; food safety, good agricultural practices and good handling practices for strawberry producers and processors; and economics of production and marketing of strawberries. A field day is also planned at UAPB’s Agriculture Demonstration and Outreach Center in Lee County. Demonstrations will include high tunnels and low tunnel systems; sustainable soil management and irrigation water management. For more information or to register for upcoming workshops, contact Dr. Leonard Githinji at 870-575-7224 or githinjil@uapb.edu.